Search online for “activities for seniors” and you’re likely to find numerous crafts, games, memory stimulation puzzles, and of course, the requisite bingo. However, what you won’t discover—unless you dig a little deeper with your searches—are the meaningful, beneficial activities that give significance to our lives. And yet, if you ask older individuals what they most want to do, the majority of them won’t mention bingo, crafts and games. What they want more than anything is to feel useful. The University of Minnesota reveals details on how the most vulnerable times in our lives are a person’s first year of life, and our first year after retiring. The loss of the sense of purpose found in a fulfilling profession can cause significant health issues – and even an earlier fatality rate, if that awareness of purpose is not maintained in some way to allow the person to encounter an ongoing sense of being useful. Consider local and national businesses that help those in need – veterans, the homeless, animals, women and children in poverty or crisis, etc. Organizations like Mothers Against Drunk Driving have ribbon campaigns that require folding, cutting, and stapling measures of ribbon to cards for distribution. Animal shelters and humane societies are usually in need of donated towels and blankets that can be washed and folded at home; or older individuals and family members could prepare homemade pet treats together, or perhaps even take dogs for walks together or interact with kittens. Put together care packages for veterans or the homeless with travel-sized toiletries, snacks, etc. Work on coloring pages or other crafts together, letting the older person know they will be presented to a local domestic crisis facility to cheer up the day for women and children. Ensure there are various opportunities to help out with as many household tasks okay for seniors as possible—sorting and folding laundry, shelling peas, setting the table, etc. Always let the individual know how much his or her help is required and appreciated. At Hired Hands Homecare of the Tri-Valley area, our dementia support services go beyond just providing care in the home; our caregivers are dedicated to helping older individuals live lives filled with purpose. 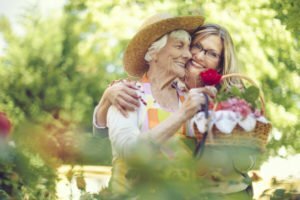 For more guidelines and suggestions on helping older individuals maintain the highest possible quality of life, or to learn more about our dementia support services, contact us any time online or by phone at (866) 940-4343.